Thematically, there isn't much to the game. Your town is being overrun by cobras, so the government has put a bounty on cobras' heads. Wisely, you've decided that now's the time to start breeding them - but you have to be careful. If you turn in too many heads at once, the government will catch on and pay you less for your haul. Mechanically, what this translates into is a peak number of cobras that you would want to turn in at once: seven. Turn in less and you'll earn less money. But turn in more and you'll earn less, too - and the drop off is steeper than the climb. In order to turn in cobras, you have to win a trick - at which point you turn in all of the cobras that you've collected since your last winning a trick. All players who lose, though, split the cobras in the center of the table from that trick. 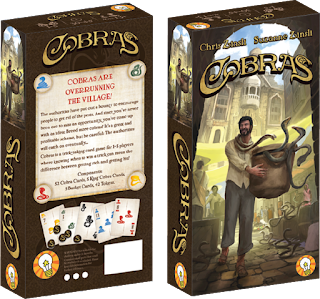 In addition to the trick-taking standard of cards needing to be played (if possible) on suit and the highest on-suit card winning, Cobras adds one more piece of information to each card: 1, 2, or 3 cobras (with higher value cards having more cobras). 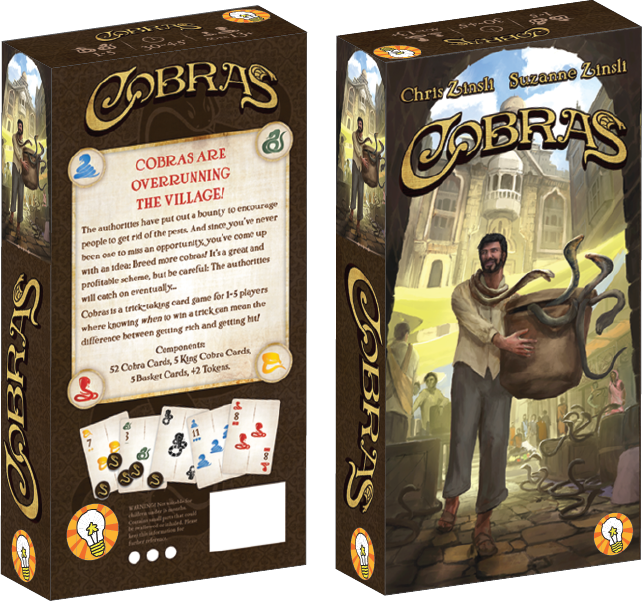 Once all cards are played in the trick, cobras are added to the center of the table. The winning player turns in the cobras in their "basket" (the cobras acquired in previous tricks), and the losing players split the cobras in the center, adding them to their basket. The player who won the trick leads the next trick. 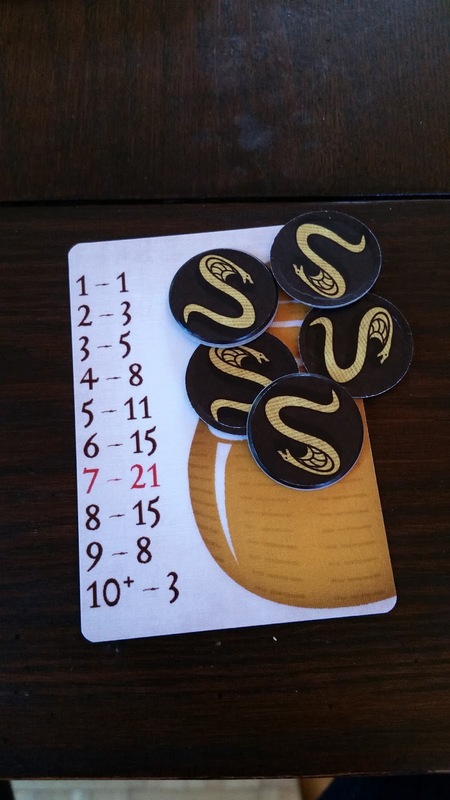 And, in a stroke of brilliance, each player gets one "King Cobra" card each hand: a card that the player can play to either win or lose the round automatically, allowing players to have a little bit more control over when they turn in baskets. There are other rules that you can read here, but those are the important changes from standard trick-taking games: you don't always want to win a trick, and you have to carefully balance your plays against other players. For example, in one of my games, the winning player won not from her high score - but from carefully sticking her opponents with losses when they had a lot of cobras in their basket already, thereby dropping the points they earned for their baskets when they turned them in. This small change makes all the difference. In Cobras, there are multiple paths to victory. With one exception where the player didn't like trick-taking games at all, everyone I've played this game with - from five-player games with teenagers who had never played any trick-taking games before to three-player games where all the players were experienced trick-taking players - all loved the game. Cobras is one of the best, smoothest, most polished trick-taking games that I've ever played. The rules are intuitive, the mechanics are simple, and the decisions are meaningful. I loved this game, and I'm confident that anyone who likes trick-taking games at all will, too. Cardboard Edison has done it again. Full disclosure: I'm personal friends with Suzanne & Chris Zinsli, but I don't believe my friendship with them as influenced this review. I was provided with a prototype copy of the game so that I could do this review.